In contemporary China, art is booming with the fast arrival of new waves of young artists. On 20 August, 2018, three award-winning young artists from China, Li Jun (李军), Lu Hui (卢辉) and Chen Jun (陈俊), were in ACIAC for a visit and a workshop. Li Jun, Lu Hui and Chen Jun were the recent winners of the Chinese Contemporary Youth Ink Yearbook Award (中国当代青年水墨年鉴奖) in 2018. Co-organized by Nanhai Media of Australia and Zhong Ce Art in China, the annual Chinese Contemporary Youth Ink Yearbook Award started operation in 2017. As this year’s winners, the three artists were invited to Australia for a visit as artists-in-residence and between 17 and 22 August, some of their works were put on an exhibition in Sydney. ACIAC Director Professor Labao Wang welcomed the visitors and introduced the Institute before the workshop. 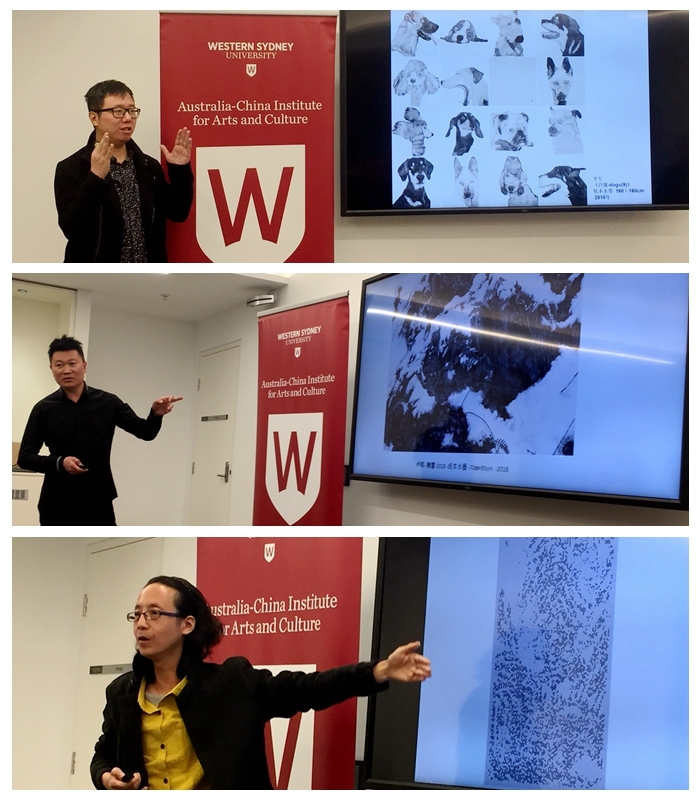 After Chen Bingbing’s brief introduction, the three artists used images of their paintings and spoke about their growth and developments as artists. Li Jun spoke of his numerous dog paintings and his treatment of these animals as if they were human beings. His paintings featured single dogs, dogs together, dogs with other animals, and dogs wearing different hats, whose human eyes pointed to the artist’s real intent. Lu Hui painted a lot of photo-realist bleak paintings of inter-twined tree roots, and snow-covered tree branches and overlapping bamboo leaves, and he thought such a focus on the messy corners of the plant world taught him a lot about the truth of life. Chen Jun spoke about his discovery of a unique artistic language in the dots for the painting of brightly coloured and postmodern urban landscapes. His paintings differed from traditional landscape scrolls in that they took on the modern glamour of urban life in their various colours. Each of the artists took questions from the audience after their presentations. In responding to these questions, they stressed that, for years, a lot of young Chinese artists are working very hard for their artistic innovation. For that purpose, many have tried a combination of tradition and individual talent. They pose as the inheritors of traditional Chinese art but they also see themselves as the modernizers of Chinese art in a new age. 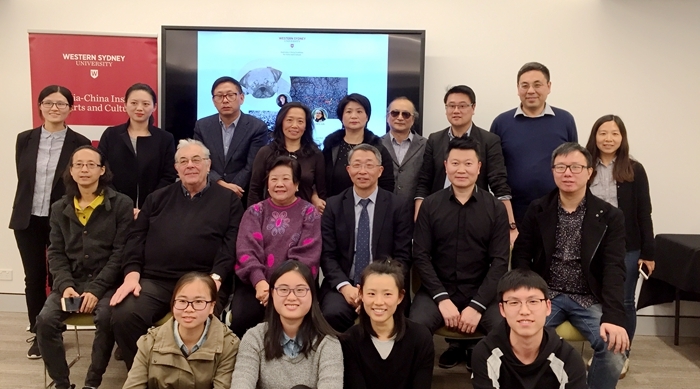 ACIAC Advisory Board member Helen Sham-Ho, our key researcher and photographer David Cubby, local artists such as Chen Bingbing and Luping Zeng and some of the Institute’s master’s students attended the workshop.